ROKU - Add Channels and Roku Express. Official Channels: These are installed from the Roku Channel Store. 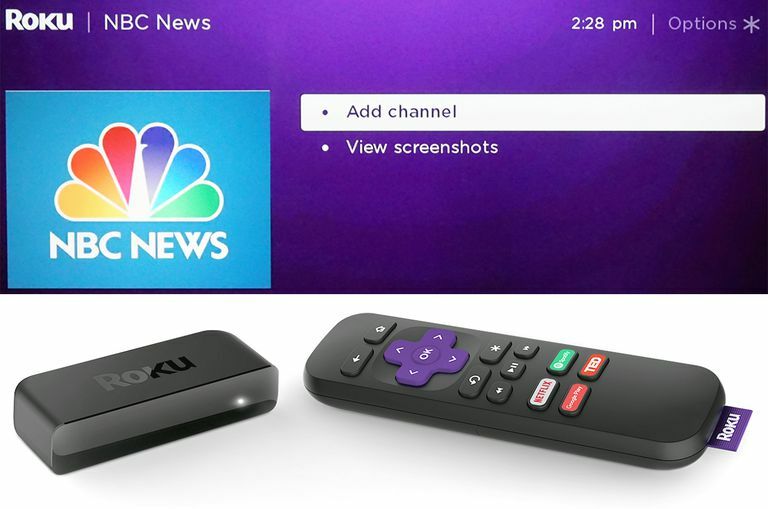 You can add channels from the channel store using a Roku device, Smartphone, or PC. "Secret", "Private", or "Non-Certified" Channels: These are not listed in the Roku Channel Store and require a special code to activate using a Smartphone or PC (not your Roku device). You will be able to view these channels via your Roku device once added. To add a channel via a Roku device, press the Home Button on your Roku remote control, and then click on the Streaming Channels option. This will open the Roku Channel Store. In the Roku Channel Store scroll through any of the channel categories (such as New and Notable, Featured, Popular, Movies/TV, News/Weather, Kids/Family, Music, and more) and find the channel you would like to add. Also, if you know the name of the channel you want to add, you can also click on Search and type in the name of the channel to see if it is included in the list. Once you find your channel via category or search, you can simply click on Add Channel and it will be installed on your Roku device and placed in your home menu for easy access later. However, before you add a channel it is important to take note if it can be installed free, or if there is a fee. If you set up your Roku account with a PIN number, you can type in the PIN and you will be charged accordingly, if you don't have a PIN, follow any additional instructions to make payment. Another thing to point out is that there are cases where a channel may be free to install (such as Netflix, Hulu, or Vudu) but you may still be required to pay a subscription or pay-per-view fee to access content. If you don't know this information ahead of time, the first time you open the channel or app, you will see an onscreen notice regarding any subscription or pay-per-view fees. In some cases, you may be offered a free trial, usually 7 or 14 days, after which you will be billed automatically unless you actively cancel the service. You can add channels using the Roku Mobile App. If you have the app installed on your smartphone, open your account, make sure it is linked to your Roku device, and tap the Channels icon on the navigation bar at the bottom of the screen. To add channels, click on Channel Store near the top right corner of the screen. Browse the channel store by category or genre, and select a channel to view more information. You can also tap the search icon in the top right-hand corner of the screen if you know the name of the channel you want to add or launch. Then click Add Channel. To add channels using a PC or Laptop, the first log into your account and click on Channel Store. You can then scroll through the Roku channel categories running from left to right and select from the channels listed. The displayed channel will show whether they are already installed or have the Add Channel option available. When you see a channel you might like, you can install it immediately by clicking on Add Channel, or click on the Details icon and get more info about the channel first. Also, just as with adding channels using your Roku device, you also have the option of finding and adding channel using the provided search box. Any channels added using your PC, Laptop, or using the Mobile App will automatically show up on your Roku device as well (there may be a slight delay before it appears). This means whether using your Roku device to add channels directly or your PC, Laptop, or smartphone you can also find out what channels you have installed on your Roku device. In addition to being able to add channels from Roku's official list of over 5,000 choices (location dependent), there a large number of "Private", "Secret", or "Non-Certified" channels that you can add. Roku uses the term Non-Certified. The term "Private Channels" does not refer to channels for your own home videos or photos. Roku has special guidelines for creating and testing channels. These channels are often beta versions or ones that haven't made it to Roku's official list. Also, some private channels feature Adults-only content that Roku does not want to list in its main channel store. In most cases, non-certified channels do work fine, but you may encounter glitches and, in some cases, the content isn't always updated on a regular basis, and there may be intermittent service interruptions. Adding these channels requires a special code provided by the channel provider. Although there isn't an official listing of non-certified channels, two good un-official, periodically updated lists are maintained by TV Streamin.com and MKVX Stream. In some cases, you may find that a channel on these lists is also on Roku's Channel Store. Depending on when either of the above lists was last updated, a specific channel may have been approved for inclusion in Roku's official listing. If so, you can install the channel using standard Roku add-channel function discussed in the previous section. However, if you do enter the "Private Code", Roku will take you to the normal Add Channel page anyway. Once you have found a non-certified channel that interests you and have the needed code, you need to go to my.roku.com on your PC or Smartphone. As mentioned previously, you can't do this from your Roku device directly. It is also important to point out that Roku is not responsible for any fees that a non-certified channel may require, so if you have any questions or issues, you must contact the channel provider directly. If the above conditions regarding the use of non-certified channels on your Roku device is not a problem, click OK to continue with the installation. Once you have entered your code and installed the channel, it may take a while for it to appear as a selection on your Roku device (may be up to 24 hours). However, you can go into the Settings option on your Roku device, click on System, and then click on System Update and see if your Roku device has detected it yet. Being able to add lots of channels on your Roku is great, but you may find an occasion where you want to delete a channel for various reasons (not interested in the subject matter of the content, the channel has been discontinued, or too many glitches on a non-certified channel). You can remove any channel by going to the Roku Channel Store using your Roku device or the Roku Mobile App and locating the channel from the list or via search and then click on Remove Channel. If the channel you want to remove is a paid-subscription or fee channel, you must first cancel your subscription before deleting the channel from your Roku device (unless the same subscription is being used on other non-Roku devices). In other words, if you delete a subscription service, such as Netflix from your Roku device, and that is the only device you are accessing Netflix on, if you don't cancel your subscription first, Netflix (or other paid subscription service) will still bill you. With over 5,000 channels and app offerings, Roku provides access to the most comprehensive movie, TV, and music streaming experience available. While many channels may require an additional subscription or pay-per-view fees, a large number also provide access to free content. When you first get your Roku media streamer or Roku TV up and running, you have instant access to a core selection of popular internet streaming channels and apps, but you can add more, a lot more, including "secret" channels that are not officially listed in Roku's Channel Store.